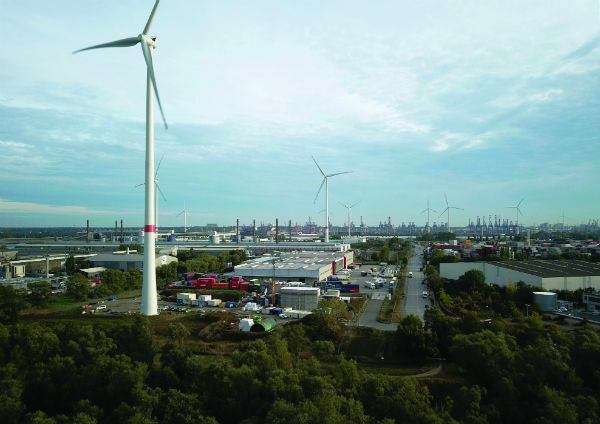 On 26 September Siemens Gamesa Renewable Energy (SGRE) celebrated the topping-out ceremony of its electric thermal energy storage (ETES) facility in Hamburg–Altenwerder. The facility can store up to 30 MWh of energy and boasts maximum scalability at a low investment cost. The pilot facility is currently in the final construction phase, and all of the storage facility’s buildings and main components have already been completed. The storage facility is set to be commissioned in 2019. Scientists from the Institute of Thermo-fluid Dynamics at the Technical University of Hamburg and the energy supplier Hamburg Energie have been involved in the development. Hamburg Energie is Hamburg’s municipal energy supplier and will sell the stored power on the energy markets. It has developed an IT platform to which the storage unit is connected. The platform guarantees that maximum possible proceeds are achieved by an optimised storage usage. The Federal Ministry of Economics and Energy is promoting storage development as part of the Future Energy Solutions project. Many current of storage facilities have limited capacities or the storage technologies are too expensive, however. With ETES, Siemens Gamesa has developed a storage facility that reduces the construction and operating costs of larger storage capacities to a fraction of the usual level for battery storage. In commercial use, the technology can store energy at a cost of well below ten euro cents per kilowatt hour. The simple thermal principle of the storage facility is based on known components which are used in a new combination. For example, fans and heating elements from series production are used to convert the electrical energy into a hot air flow. The same applies to reconversion: a highly dynamic Siemens steam boiler is used as standard in a steam turbine to produce electricity at the end of the storage chain. Siemens Gamesa invested the largest amount of research in the insulating container filled with a rockfill, the core of the innovation. In this research project, the Siemens Gamesa team investigated the thermo- fluid-dynamic principles of bulk material storage technology. Their findings enable scaling to the current scale. “We are proud to be able to offer this important technology as a fully functional solution for our customers after just a few years of development work,” says Hasan Özdem, Head of Technology Management and Projects at Siemens Gamesa. “A very interesting option of our technology is to convert decommissioned thermal power plants into high-performance storage facilities for renewable energies at a low cost.” With this second-live option, the majority of components such as grid connection, turbines and generators can continue to be used.